I am back with another roundup of my latest purchases. It's always helpful for me to style things I buy into a flat lays because it helps me remember that I have them (let's be real, I have a lot of stuff and things can get lost in the mix, even new pieces!) And it helps me share my purchases on an immediate basis with you guys (while stuff is still available, hopefully) since sometimes things like weather may prevent me from wearing new things right away. First up is this embroidered romper that I first mentioned in this post here as I was eyeing things I wanted to buy for the latest Shopbop sale. You may have seen my snaps about this. Initially I wasn't going to keep it because while it is beautiful, it's basically shaped like overalls which means it has no sides to the top and not much of a back. It would end up being a swimsuit cover up and I thought, for the price, it was not worth it if I could only wear it to the pool. But then I had an "aha!" moment and realized it would look awesome under a jacket! Yay! Since I can make it work for real life and not just beach life, it was a keeper! Express has had a few good sales lately, and I stumbled upon this striped sweater. I loved that it was spring colored! I styled it with my blush skinnies here, but it would be perfect with just regular old denim shorts and Chucks for a cooler summer evening. Gap has been stealing all of my money lately! This tee and vest are two pieces I already have in my collection in different colors. You can see the grey version of this top in this post and the charcoal version of this vest in this post. I was on the fence about whether or not I needed another utility vest, but I figured I would regret it if I didn't. I don't think any vest could replace the versatility of my beloved olive one, but it's certainly nice to have other options in my wardrobe. Here's another follow up on my Shopbop sale purchases! This ruffle hem tee is the perfect basic. It has an easy relaxed fit, and I'm so so happy I got it! But now I want all the other ruffled pieces by Clu!!! The struggle. And last but not least is this embroidered tee from Gap. I'm a sucker for anything embroidered, and with Gap's crazy sales lately, I got it for next to nothing. 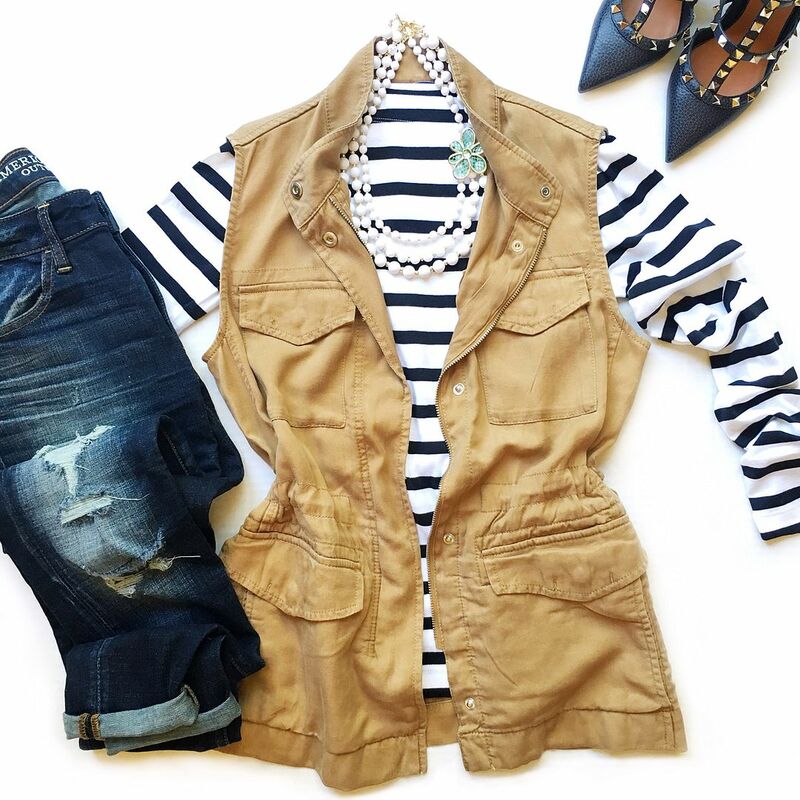 And it pairs perfectly with the striped ball skirt! That's all I've got for you today! You will have to let me know what you've been buying! All so fun! Especially loving that turquoise striped sweater! The ruffle tee and romper are our favorites! All great purchases. love the first outfit. So pretty! I love following all your buys + hauls on Snap, girlfriend! great purchases! love all those darling shoe picks! How fun is that KS necklace..I have not seen that one!